The Genie brand was born in 1966 with the original Genie® Hoist – a unique portable pneumatic lift that was so successful, it launched the development of a full range of material hoists and aerial work platforms. 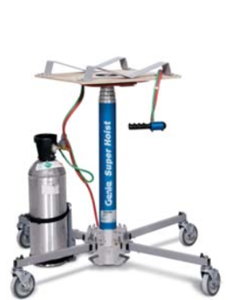 Today's Genie® Super Hoist™ continues the legacy of innovation with an incredibly compact, easy-to-use design. Allows one person to lift and move heavy loads. Provides approx. 80 to 90 lifts from a single tank of CO2. One-size-fits-all bracket accepts any common CO2 bottle size. Completely portable; easy to store and transport. Easy-to-release leg lock keeps legs up for storage or out for use. Auto-lubricating oil reservoir on top of each piston inside the cylinder.